Even wonder how you can do a screenshot of any website in simple way? There are multiple freeware that can help you out but in case you are not fully satisfied with any of them, you may want to give this tiny utility a try. 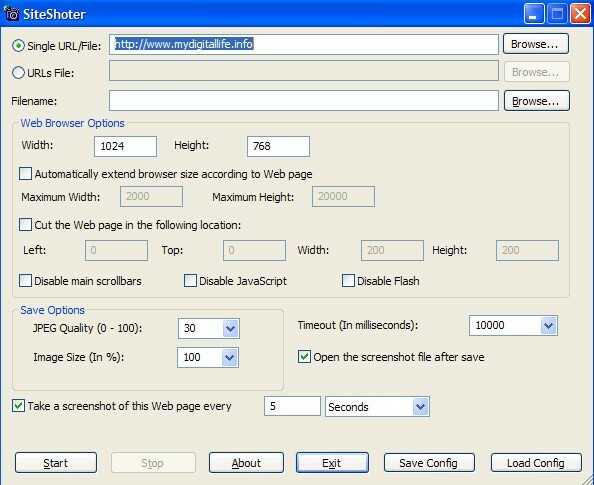 Named as SiteShoter, it is a tiny portable utility that allows you to capture screen shot in predefined intervals and customized viewing format for reference at later stage. Consumes less than 100kB, SiteShoter is compatible with Windows Operating Systems such as Windows XP, Window 2003/2008 Server, Windows Vista and even Windows 7.